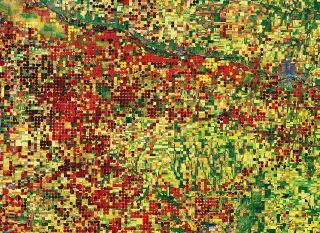 Kansas, United States of America: This false-color image shows the circles formed by a central-pivot irrigation system and the rectangles from their pipes rolling across the fields. NEW YORK — While wandering through a maze of vividly detailed depictions of Earth's surface currently on display here at the United Nations Headquarters Visitors' Lobby, a viewer might mistake the images for abstract art. The photos, taken from space, make the shapes of cities, farmland, mountains, ice and water nearly unrecognizable. But they are real photographs, and crouched at the center of the exhibit like a spider is a 1:10 scale model of the European Space Agency's Sentinel-1A satellite — one of the sources of these incredible images. All of the images at the "My Planet from Space: Fragility and Beauty" exhibit, which runs until Sept. 9, are scientific images of Earth taken by satellites. Researchers use them to assess the state of the planet — and the exhibit's curator, Viviana Panaccia, hopes visitors to the exhibit willdo the same. Namib Desert, southwest Africa: Sand dunes, some reaching higher than 300 meters (about 1,000 feet), dominate the world's oldest desert. The blue-and-white area is the dry riverbed of the Tsauchab, which only sees water following rare rainfall in the Naukluft Mountains to the east. "My Planet from Space" first opened in Rome last year, drawing 20,000 visitors in just four weeks, and settled into the U.N. Headquarters Visitors' Lobby New York in July. Its images are separated broadly into categories like Ice, Deserts, Cities and Atmosphere. Some are colored artificially to help highlight particular aspects of the images, such as elevation or humidity, but they are all true images of Earth in incredible detail, with clear resolution down to the meter scale, in some cases. The large printed photographs offer the option of leaning in close to make out small, crisp details. The images were chosen to fulfill two goals: to showcase the planet's beauty, and to help scientists better understand the planet's inner workings. "The selection was very difficult because I wanted to choose images with strong content in terms of scientific value," Panaccia told Space.com. Panaccia chose to focus on categories that would show the ways human activity is changing the Earth. The images often highlight how the regular patterns of human-made structures overlap with naturally occurring features, also forming their own self-consistent shapes. The interface between the two isn't always smooth, but it often makes for a vivid picture. Lake Mead, United States of America: This massive reservoir was established in the early 1930s by the construction of the Hoover Dam on the Colorado River. Drought and increased water demand in recent years have resulted in a decline in water levels that hit record lows in 2014. Erg Iguidi, western Sahara Desert: This area of wind-shaped sand dunes is relatively humid, with abundant groundwater toward its northeastern edge. Patches of seasonal vegetation support gazelles, and the area is even used for pastures. NASA's Explorer 6 snapped the first satellite images of Earth from orbit on Aug. 14, 1959, and the first weather satellite flew one year later. Those first images provided an incredibly valuable new scientific perspective of the Earth from afar, but it took years for the light-and-dark blurs to resolve into images humans could appreciate at just a glance. The new exhibit shows the storytelling power of this new appreciation. "I think that it's a new way of communicating," Panaccia said. She's seen the images illustrate difficult truths about climate change and Earth's fragility without prompting a negative, dismissing reaction. And she is particularly glad to house the exhibit in the United Nations, where delegations are discussing the very topics the images showcase. "We are talking about a global problem," Panaccia said. "Satellite images are the best means to have images on a global scale."